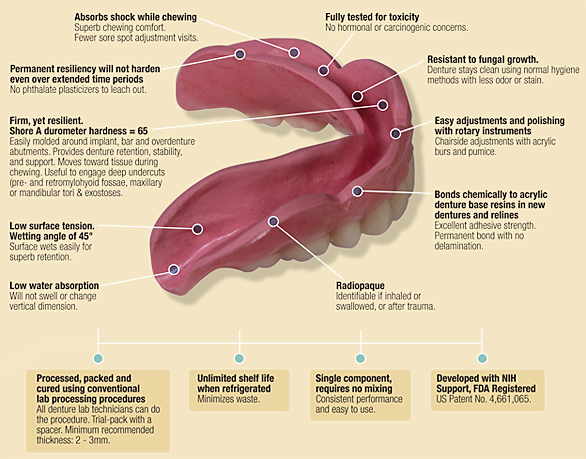 There are many denture liner and reliner materials available. One option are the plasticized acrylics, often using phthalate esters, which bond well to the denture base but rapidly loses plasticizers and harden. Silicone rubber retains its resilience but often grows fungus. Polyurethane is harder, absorbs colorants from foods, requires special processing equipment, and also grows fungus. To improve patient denture care, the polyphosphazene (PNF) based material in Novus is the answer. PNF is a synthetic rubber that is permanently resilient , phthalate-free, absorbs energy from chewing, has low water absorption, resists fungal growth and is color stabile. 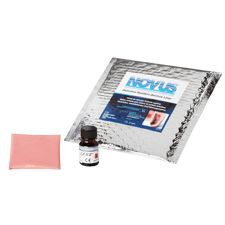 During lab processing, NOVUS bonds chemically to fresh denture acrylics, uses standard denture processing procedures, equipment, and temperatures, and is easily finished and adjusted with ordinary rotary instruments in the lab, dental office or anywhere in the field. 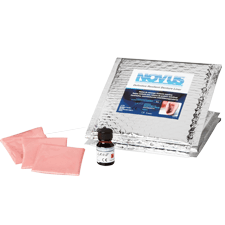 "Your Novus seems to work as advertised, as I have processed my first ever Novus permanent soft liner case. The Novus material did not disappoint and to our surprise provided an excellent result. The patient had a history of denture problems, so it was decided that we would attempt to place the Novus on the upper as well as the lower denture. Upon insertion there were no obvious sore spots or pressure points evident, which was not the norm for this patient. After further contact with this patient she continues to have a level of comfort never before achieved with any other soft liner we have used in the past. It is highly recommended that this be processed using a muscle molded final impression to achieve proper border extensions. The material seems to exhibit excellent properties, bonds well, easy to trim and polish, packs quickly, and can be short cured. There is a short learning curve with this product but the results are well worth it." "I have found NOVUS™ to solve even some of my most difficult patient problems in denture function, retention and comfort. I have to say I like everything about Novus™! Patients tolerate their appliances better and function better even in challenging situations such as knife edged ridges. All of this and the relines last trouble-free for years!" "This short-term evaluation shows great promise for providing dentists and their patients a solution to a long chronic problem of finding a truly resilient liner for dentures that maintains color, texture and softness for a long period of time." To request additional information regarding NOVUS, feel free to contact us today.